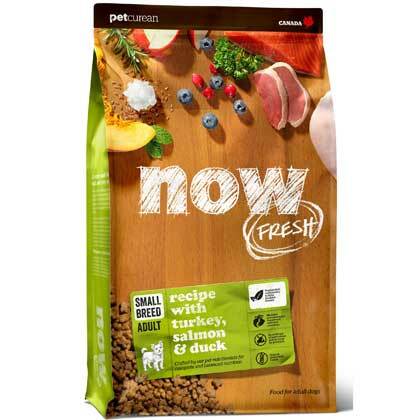 What is Now Fresh Grain Free Small Breed Recipe Dry Dog Food? Now Fresh Grain Free Small Breed Recipe Dry Dog Food is a unique dry dog food made with 100% fresh meat from simple protein sources consisting of fresh turkey, duck and salmon. The nutrients are packed inside a small clover-shaped kibble that smaller dogs love. The kibble also contains TriPolyPhosphate, which repels plaque build-up and formulated to freshen breath. Now Fresh Grain Free Small Breed Recipe Dry Dog Food does not contain grains, gluten, wheat, beef, corn or soy, rendered meats, by-products or artificial preservatives. It does contain omega oils for skin and coat health, and prebiotics and probiotics for digestive health. In addition, Now Fresh Grain Free Small Breed Recipe Dry Dog Food contains DHA/EPA to support brain development. Plus the ingredients in each bag of Now Fresh Grain Free Small Breed Recipe Dry Dog Food are slow baked at 194° to maintain maximum nutrients for adult dogs. How does Now Fresh Grain Free Small Breed Recipe Dry Dog Food work? Now Fresh Grain Free Small Breed Recipe Dry Dog Food was developed with veterinarians and certified nutritionists to ensure your dog receives the necessary nutrition needed to maintain an active lifestyle. It is slow cooked only once to preserve nutrients, which are typically lost in many commercially processed foods. Although other grain free dog foods may contain higher levels of protein, this excess is ultimately eliminated through your dog's urine, offering little to no benefit to your dog's health. The Now Fresh Grain Free Small Breed Recipe is a unique blend created to address common health problems in small dog breeds such as tartar buildup, bad breath and digestive problems. Ingredients green tea, parsley, peppermint and the cloverleaf shaped kibble help clean teeth, maintain healthy gums, and eliminate bad breath. The digestive enzymes also help to make the kibble highly digestible. Coconut oil is used in each Now Fresh Grain Free variety and assimilates directly through the stomach lining, which ultimately breaks down into simple sugars to be used as energy. Coconut oil is also believed to have antiviral benefits by reducing the risk of gastrointestinal issues (inflammatory bowel disease, pancreatitis, and food allergies). Refer to the Feeding Guidelines chart below to determine the suggested feeding amount. Other Ingredients:De-boned turkey, potatoes, whole dried egg, peas, flaxseed, apples, canola oil (preserved with mixed tocopherols), natural flavour, coconut oil (preserved with mixed tocopherols), tomato, salmon, de-boned duck, sundried alfalfa, carrots, pumpkin, bananas, blueberries, cranberries, raspberries, blackberries, papayas, pineapple, grapefruit, lentil beans, broccoli, spinach, cottage cheese, alfalfa sprouts, dried kelp, calcium carbonate, dicalcium phosphate, lecithin, sodium tripolyphosphate, sodium chloride, potassium chloride, vitamins (vitamin E supplement, L-ascorbyl-2-polyphosphate (a source of vitamin C), niacin, inositol, vitamin A supplement, thiamine mononitrate, d-calcium pantothenate, pyridoxine hydrochloride, riboflavin, beta-carotene, vitamin D3 supplement, folic acid, biotin, vitamin B12 supplement), minerals (zinc proteinate , ferrous sulphate, zinc oxide, iron proteinate, copper sulphate, copper proteinate, manganese proteinate, manganous oxide, calcium iodate, selenium yeast), taurine, DL-methionine, L-lysine, algae extract, dried chicory root, dried Lactobacillus acidophilus fermentation product, dried Enterococcus faecium fermentation product, dried Aspergillus niger fermentation product, dried Aspergillus oryzae fermentation product, yeast extract, yucca schidigera extract, marigold, parsley, peppermint, green tea extract, L-carnitine, dried rosemary.